Posted on Saturday, November 23rd, 2013 at 6:00 pm. 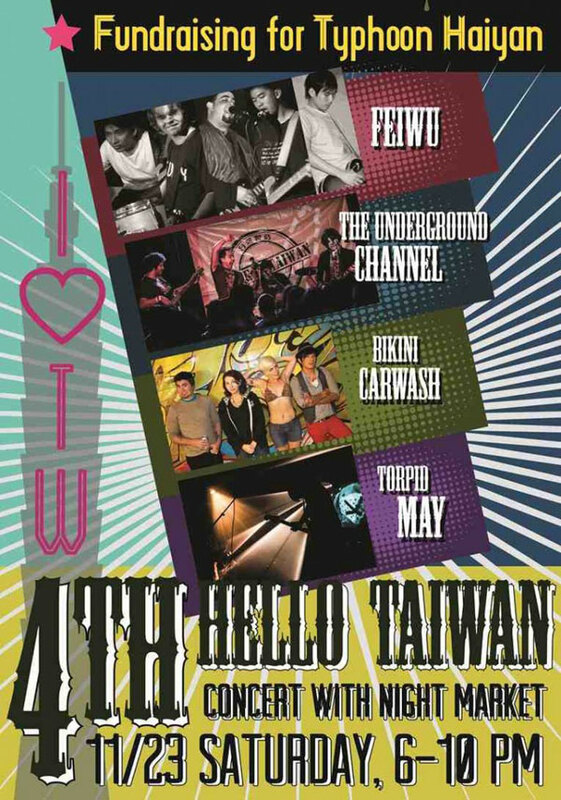 The 4th “Hello Taiwan” Concert & Night Market will once again help provide musicians with a platform to showcase their music and to kick off Thanksgiving weekend! This year, however, it will also serve as a fundraiser for Typhoon Haiyan victims in the Philippines. Free admission from 6-7pm: come early to eat, drink, and mingle! $10 after 7pm. Due to the recent severe damage caused by Typhoon Haiyan, the “Hello Taiwan!” organizers have decided that the concert proceeds will go the Philippines Typhoon Haiyan Relief effort. Last year, many local Taiwanese communities held the 3rd Hello Taiwan! concert and raised $10,000 to donate to to the Breezy Point firemen whose houses were burned down as our support to the Hurricane Sandy Relief effort. New York City has long been one of the leading centers of indie music movement. Within it, Taiwanese musicians are also in the scene making music and hoping one day in reaching to the top. The concert provided a platform for the bands to perform while the fans got to listen to many amazing Taiwanese bands perform for a night of rock-and-roll, a cultural night to be remembered together before the Thanksgiving festivities. This year, we have added more performing groups as well as some Taiwan’s most iconic snacks while enjoy the performance at the same time! Filipino musician IZZY! He is the winner of this year’s Kollaboration Talent Competition. Event will be hosted by the TV host Ben Hedges.